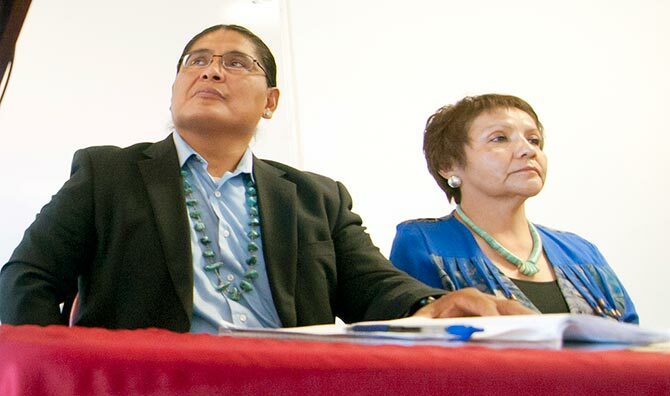 Navajo Nation Presidential candidate Chris Deschene, left, sits next to his vice-presidential candidate Fannie Lowe Atcitty on Monday, Sept. 1, 2014, in St. Michaels, Ariz.
Hozho – the Navajo principle of balance with the natural world – is among a slew of reasons presidential hopeful Christopher Clark Deschene has selected Fannie Lowe Atcitty as his vice-presidential running mate. Atcitty, of Shiprock, N.M., is considered the first Navajo woman to be ever selected for the position of Navajo Nation vice president. The 61-year-old is a long-time educator of the Central Consolidated School District, sitting president of Diné College's Board of Regents, and an active voting member of Shiprock Chapter and the Democratic Party of New Mexico. Atcitty, who is Táchii'nii (Red Running Into Water People) and born for Tlááshchí'í (Red Bottom People), holds bachelor's degree from Eastern New Mexico University in Portales, N.M. and a master's degree from Doane College in Crete, Neb. Both of her degrees are in the field of education. “Balance,” Deschene said during his Tuesday afternoon press conference announcement of dubbing Atcitty as his running mate. “I think Fannie brings a number of complimentary attributes to this campaign." The idea for Deschene to select Atcitty as his running mate corresponds with balance, or hozho, in the Navajo Creation Story – it's a principle that the Deschene-Atcitty campaign thinks has been missing in the last several presidential administrations.